STANDALONE VR HEADSET: Stow away the phones, expensive PCs and cumbersome cables and just experience awesome VR--without the extra hassle. WITH WORLDSENSE, MOVE NATURALLY: Get up off your chair and truly explore your virtual world, free from external sensors. Duck, dodge, sidestep and leap, just like in real life! COMFORTABLE DESIGN: Lenovo Mirage Solo's engineered to be so comfortable, you'll forget you were wearing it. Artfully weight-balanced and coated with breathable, thick padding, it's adjustable to your precise measurements. Mirage Solo sports a stand-out look that begs to be worn, while gesturing to the future. VR has never been so appealing. POWERFUL VR HARDWARE: With 4GB of RAM and a Qualcomm Snapdragon 835 processor engineered for lifelike VR, the Mirage Solo is the one device that pushes Daydream to its fullest potential. 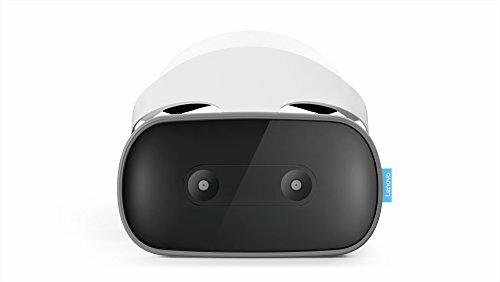 Debuting a blur-free, low-latency QHD IPS display and a 110˚ field of view, the Lenovo Mirage Solo delivers incredible VR sessions for the most demanding discoverers, offering up to 3 hours on a single charge. HIGH QUALITY, CURATED VR EXPERIENCES: Lenovo Mirage Solo puts Daydream VR's hundreds of incredible experiences at your fingertips-including YouTube, Netflix and much more. And then it takes things to the next level. Access a whole new library of WorldSense-powered experiences, such as Blade Runner: Revelations, which lets you move about and interact with your environment as you search for clues to unravel a Replicant conspiracy.